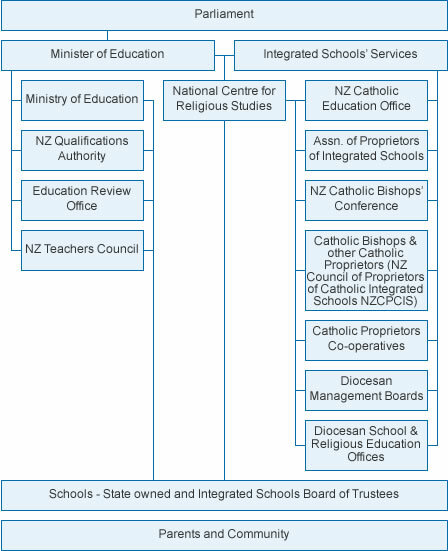 (Bishops, Religious Institutes, or Trust Boards) Legally own the school; have legal responsibility for supervising the maintenance of Catholic Special Character; have representatives on the Board of Trustees. Responsible to the Proprietor for Catholic Special Character and property; responsible to the Ministry of Education and to parents for governance of the school (including the school’s charter, strategic and annual plans, finances etc). (Principal and senior management team) Works with Board of Trustees, responsible for the management of the school, including overseeing and budgeting to resource all areas of learning. The Principal and Director of Religious Studies have particular responsibility for Catholic Special Character. Uphold and contribute to Catholic Special Character, design and implement learning programmes, care for and promote the well-being of their students.